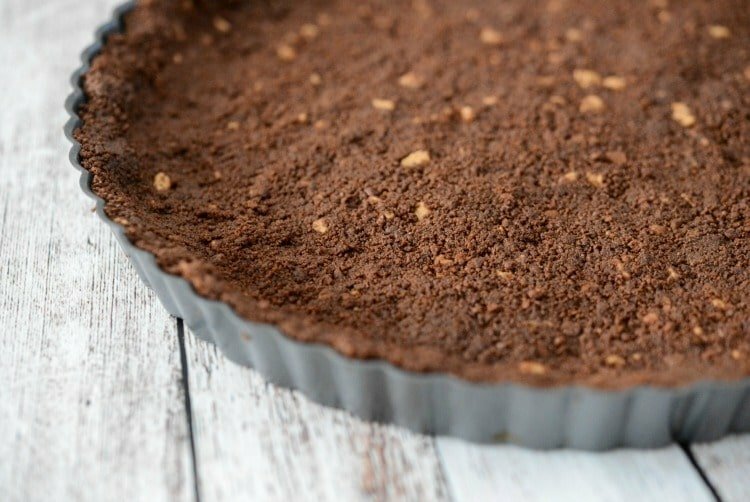 This No Bake Peanut Butter Tart with Dark Chocolate Ganache is so rich and decadent it’s perfect for holidays or special occasions, yet easy enough for a midweek dessert. 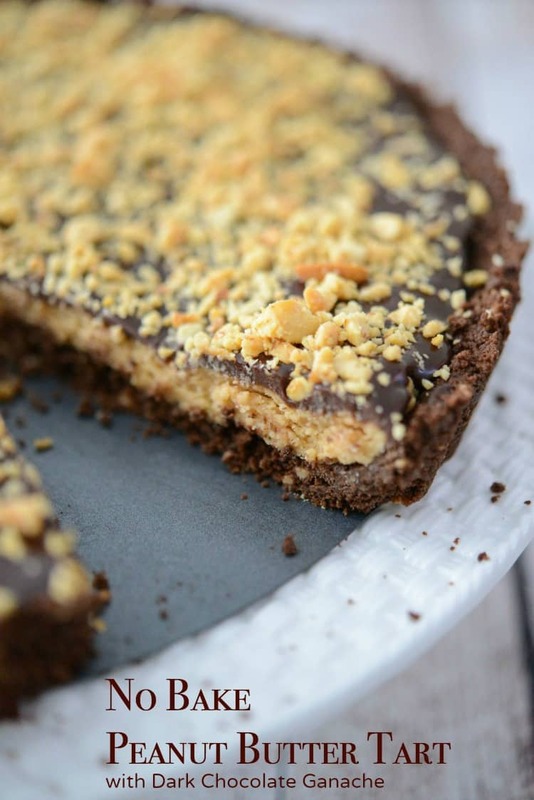 First, I want to apologize for not getting this recipe for No Bake Peanut Butter Tart to you before Valentine’s Day because let’s face it, it would have been the PERECT dessert to make for that special someone in your life. I know this because it was the perfect dessert for the special people in my life (minus my daughter at college who I froze a piece for her to have when she comes home for Spring Break). I just couldn’t find the time to get the post written and shared here with all of you in time with so many things going on in my life at the moment. 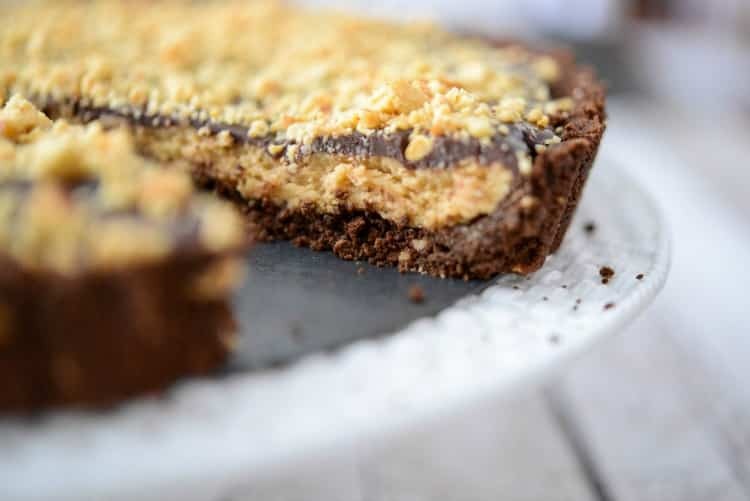 But this dessert is SO easy to make that you can make it for St. Patrick’s Day, Easter or even whip it up during the week just because you feel like peanut butter and chocolate. And really, who doesn’t love the combination of peanut butter and chocolate? Even me, the person who isn’t a big “sweets” person will enjoy a peanut butter cup every now and then. 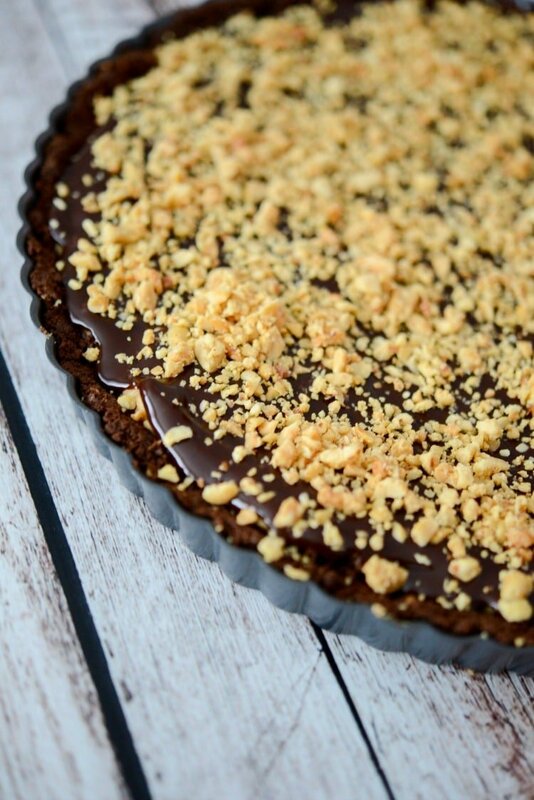 I first saw this recipe for Peanut Butter Chocolate Tart in Taste of Home Magazine a while ago and pulled it out. As I was flipping through my files, I decided to try it to make with our Valentine’s Day dinner, but there were a few ingredients I didn’t have and others I thought were overkill. By that I mean, I didn’t want to add extra ingredients if it could be made using as few ingredients as possible. That’s always my goal as I don’t like a long laundry list of ingredients while making a recipe; especially ingredients that I don’t normally have on hand. 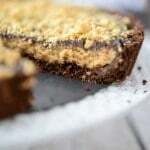 There are three steps to making this recipe, the crust, filling and ganache. All of which require no baking…BONUS! First, let’s start with the crust. The recipe called for chocolate wafers, sugar, butter and peanut butter chips. I used chocolate Teddy Graham’s (just because that’s what I found at the store, but you could use regular chocolate graham crackers), butter and peanut butter chips. I didn’t think the extra sugar was needed and you’ll never even know the difference. Pulse the chocolate graham’s in a food processor; then add the peanut butter chips and pulse again. Stir in melted butter; then press the mixture into the bottom and sides of an 11″ tart pan (with a removable bottom). Refrigerate while you are making the filling. This process takes 10 minutes. Next, you want to make the filling which is made with creamy peanut butter, butter, confectioners sugar, vanilla extract and cream cheese. The original recipe called for corn syrup and used less sugar than my version, but I liked how my filling wasn’t loose and was more like a peanut butter cup. Combine all of the ingredients together and press on top of the crust; then refrigerate for 10 minutes. See that dark, rich chocolatey goodness underneath those crushed peanuts? Yes, that is ganache; which can easily be made by melting chocolate (I used dark chocolate) and heavy cream. Again, no need to add sugar and corn syrup to the ganache; which is what the original recipe called for. Melt the two together in a small saucepan over low heat for about 5 minutes; then pour it on top of the peanut butter filling. Top with crushed peanuts and refrigerate for at least 30 minutes or overnight; then dig in. 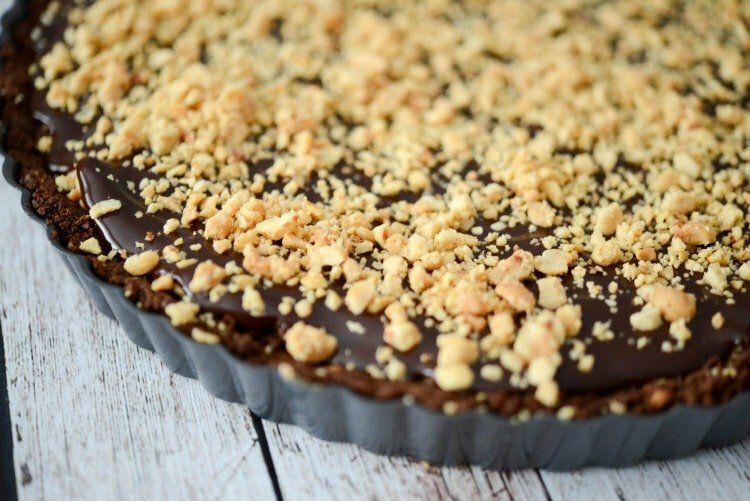 Isn’t this No Bake Peanut Butter Tart with Dark Chocolate Ganache a snap to make? Not to mention it’s delicious! My family couldn’t get enough of this one. It’s the perfect dessert for holidays, summer bbq’s or even during the week. And if you can’t eat the entire thing at once freeze it. That’s what I did and it defrosts beautifully. Just make sure you wrap it tightly and defrost in the refrigerator. ~Enjoy! 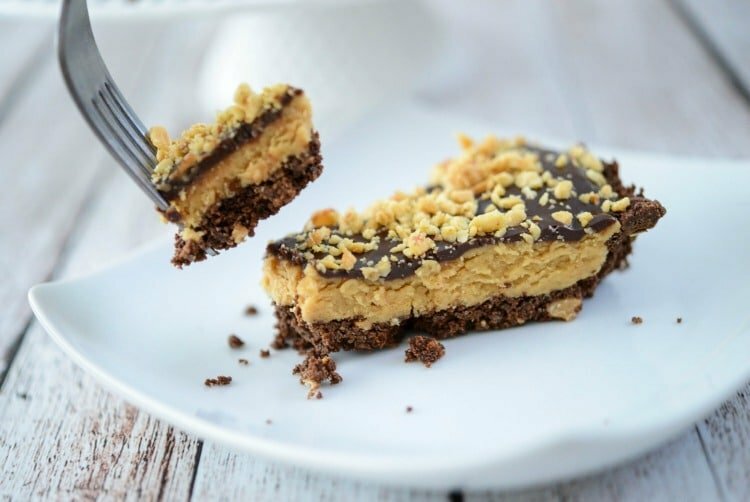 This No Bake Peanut Butter Tart with Dark Chocolate Ganache is so rich and decadent it's perfect for holidays or special occasions. Pulse the graham crackers in a food processor; then add in the peanut butter chips and pulse again. Add the butter, mix with a spoon; then press mixture into the bottom and sides of an 11" removable bottom tart pan. Refrigerate 10 minutes. Combine the peanut butter, cream cheese, butter, sugar and vanilla in a medium bowl and mix either by hand or with an electric mixer. Press the mixture on top of the crust mixture and refrigerate for 10 minutes. Heat the chocolate and cream in a small saucepan over low heat until the chocolate melts; approximately 5 minutes. 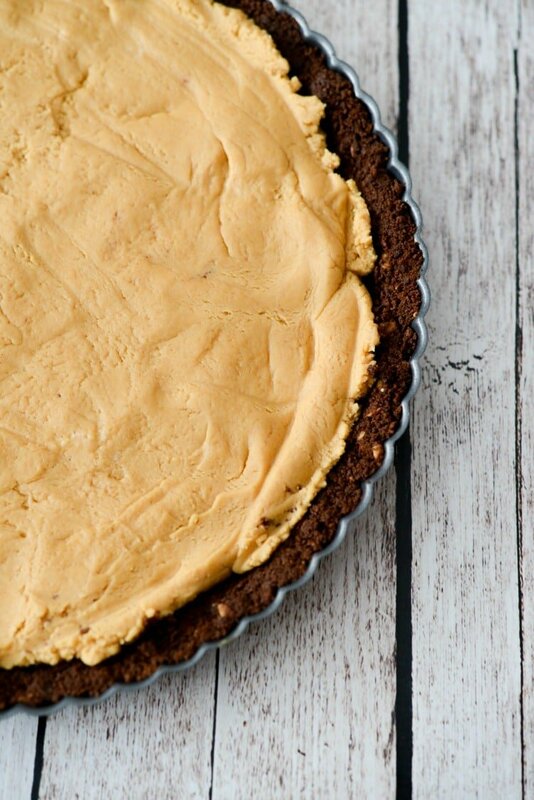 Pour evenly over the filling, top with the chopped peanuts and refrigerate for at least 30 minutes or overnight. 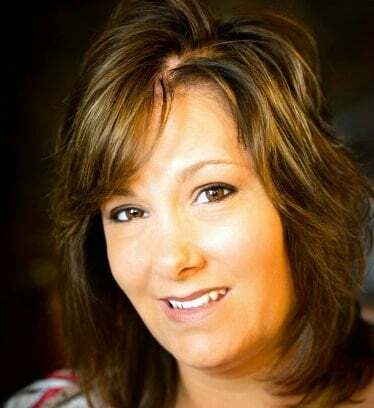 Thank you Catherine! My kids devoured it and can’t wait for me to make it again.